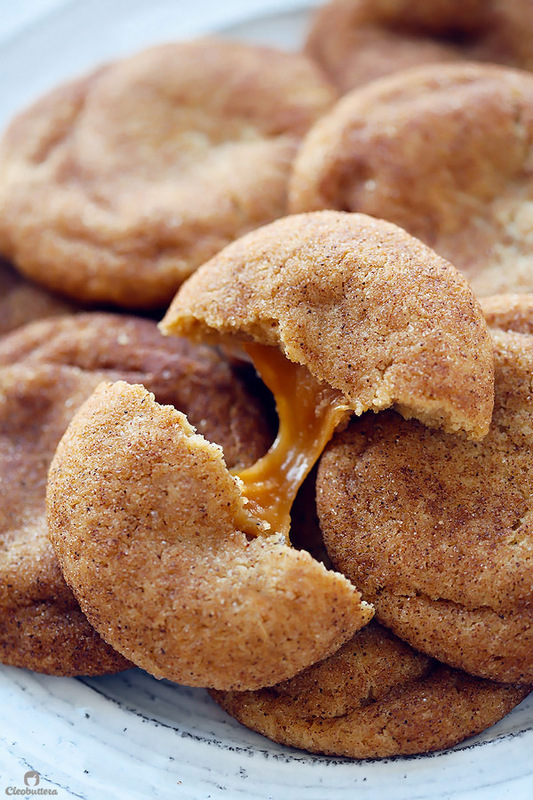 Soft, thick and chewy snickerdoodles, bursting with flavor from the addition of browned butter and an irresistible gooey homemade caramel center! But you know what’s better than snickerdoodles?! 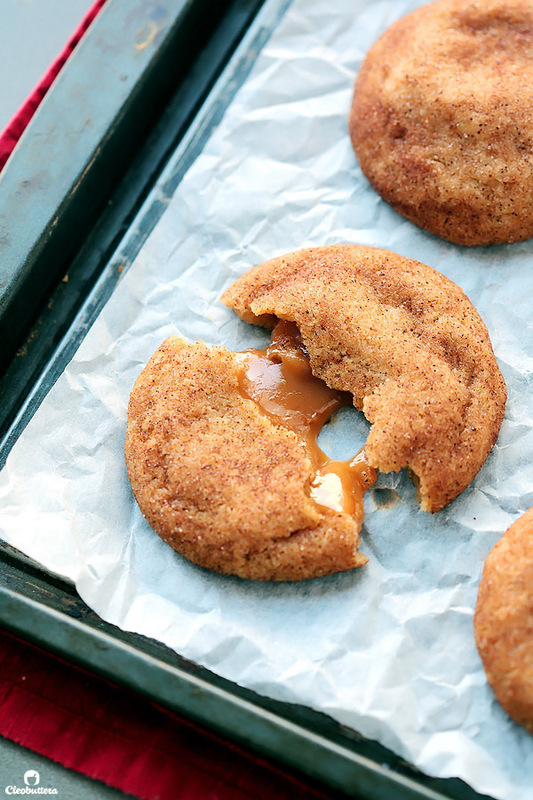 Snickerdoodles that are made with aromatic browned butter and oozing with a gooey salted caramel filling. 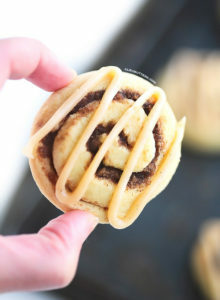 One bite of these and you might never be able to go back to classic snickerdoodles again. So what exactly are Snickerdoodles and why on earth don’t they have Snickers in them?! I asked these very same questions the first time I ran into a Snickerdoodle recipe several years ago. 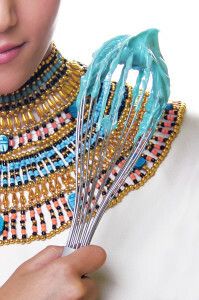 Being from Egypt, the only Snicker-anything we know of, is one that comes in the form of a peanut-y chocolate bar or something made up from the same components. 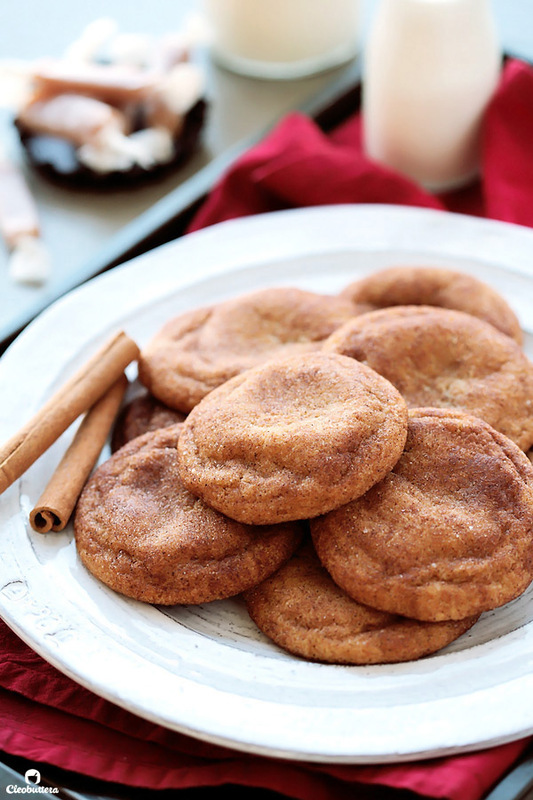 Snickerdoodle purists would go into heated discussions as to what makes a Snickerdoodle…a Snickerdoodle. As far as my humble research goes, the majority seem to agree that its a soft and chewy cookie, distinguished by its tangy flavor that comes from cream of tartar, and covered in a thin layer of cinnamon sugar. 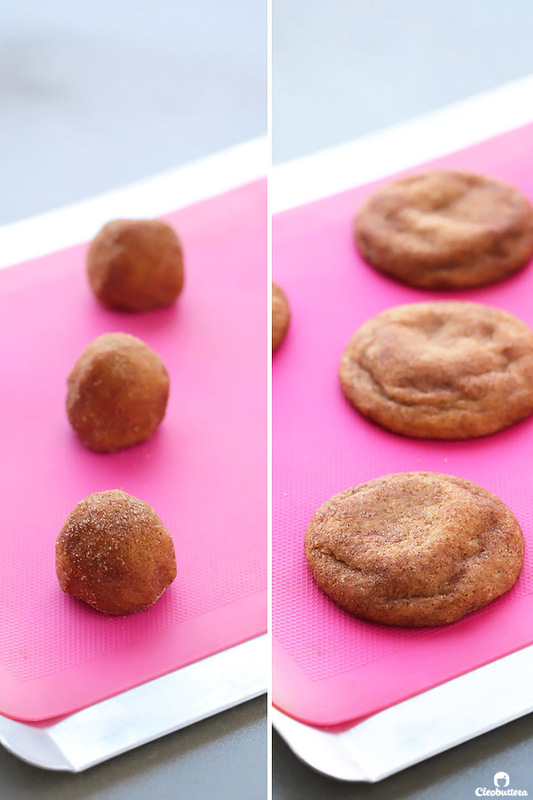 The basic snickerdoodle dough is classically made up of softened butter (or shortening…sigh!) that’s been creamed with ALL white sugar (not a speck of brown sugar in sight). 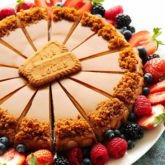 It gets its unique tangy flavor from cream of tartar, which consequently works with the baking soda to both leaven the cookie and keep it soft. 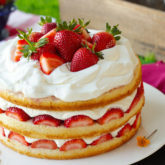 Sometimes vanilla is added for another flavor dimension, but nothing more. 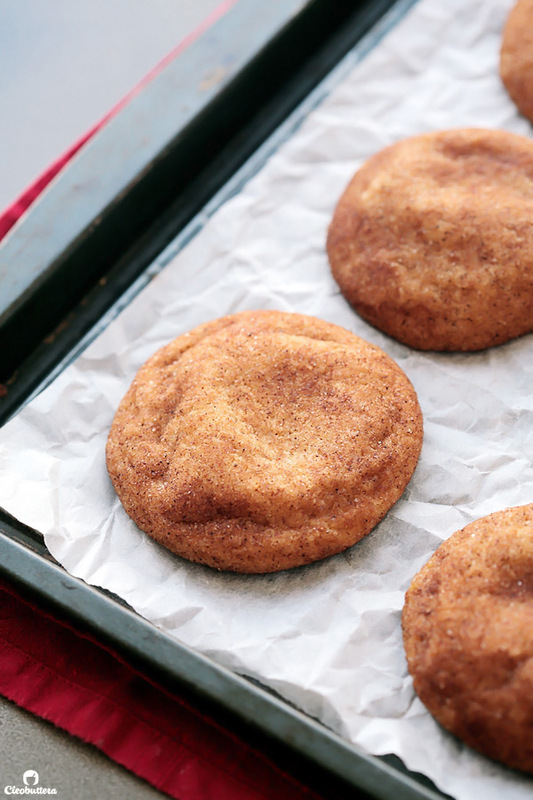 Baking rebels have been adding a tiny bit of cinnamon to the dough lately, but that’s considered a Snickerdoodle offense by many. 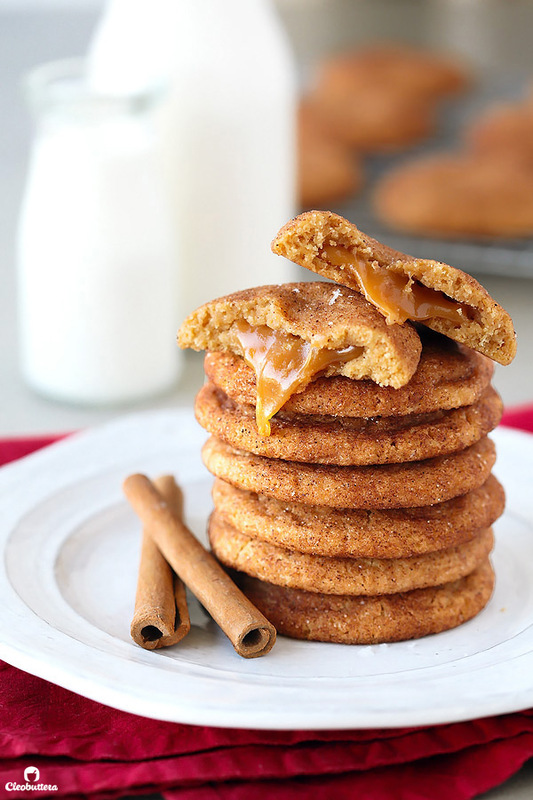 We’re diving deep into caramel-y deliciousness, putting back the cinnamon in Snickerdoodles, adding mega flavor, elevating pillowy texture, to take the cookie from GREAT, to UNBELIEVABLE! 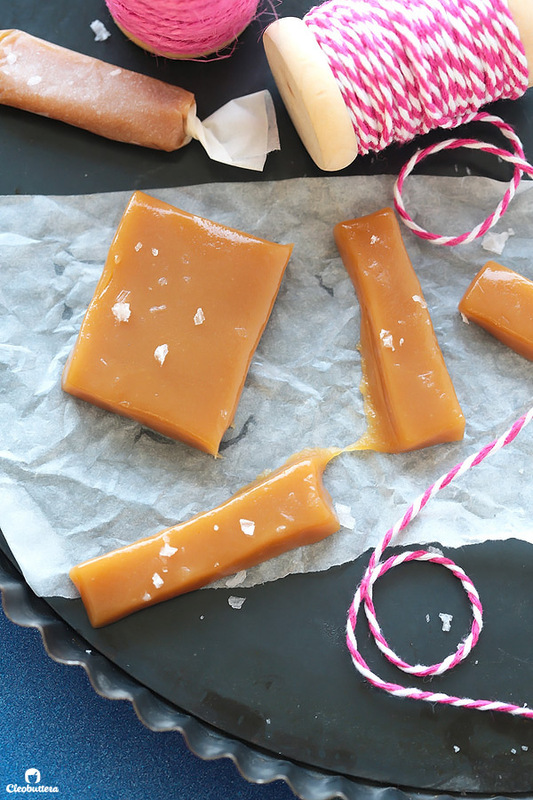 First of all, remember these easy, Microwave Soft Caramels from my last post? 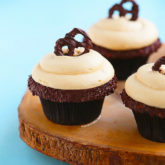 Yeeeaaaaah…we’re stuffing these babies inside of today’s cookies. 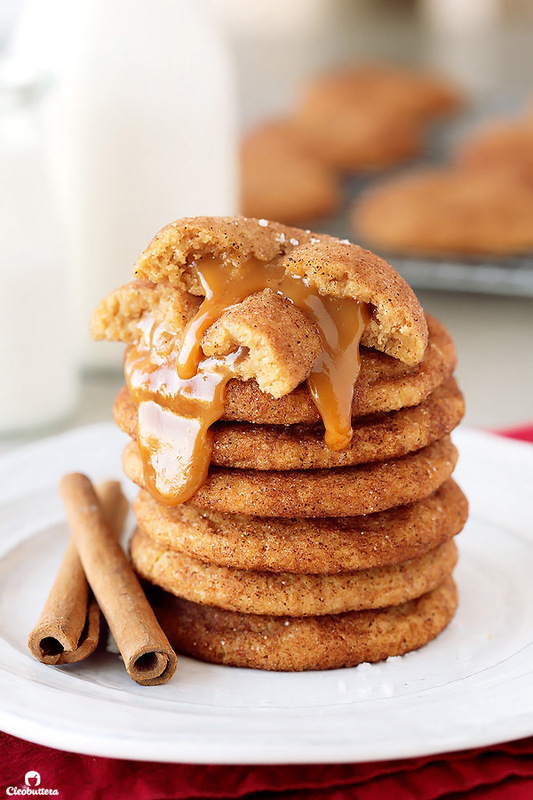 I don’t want to sound like I’m inventing the wheel here by adding caramels into Snickerdoodles, because we’ve all seen them all over Pinterest. What sets these apart though, are the fact that we’re using the softest, creamiest, homemade caramels, instead of settling for stick-to-the-teeth store-bought ones. The problem with commercial caramels, aside from the fact that the taste doesn’t even come close to homemade ones, is that they harden inside of the cookies as they cool. Straight out of the oven, they’re awesome…After a few hours though, one can’t chew through them without having to reheat the cookie to soften the caramel. I wanted a caramel stuffed cookie, that is equally good at room temperature the day after, as it is, warm out of the oven. The caramel needed to be soft enough to melt in the mouth without reheating, yet firm enough to not burst out of the cookie as it bakes. It was no easy task, until the 7-minute microwave caramels came to play. 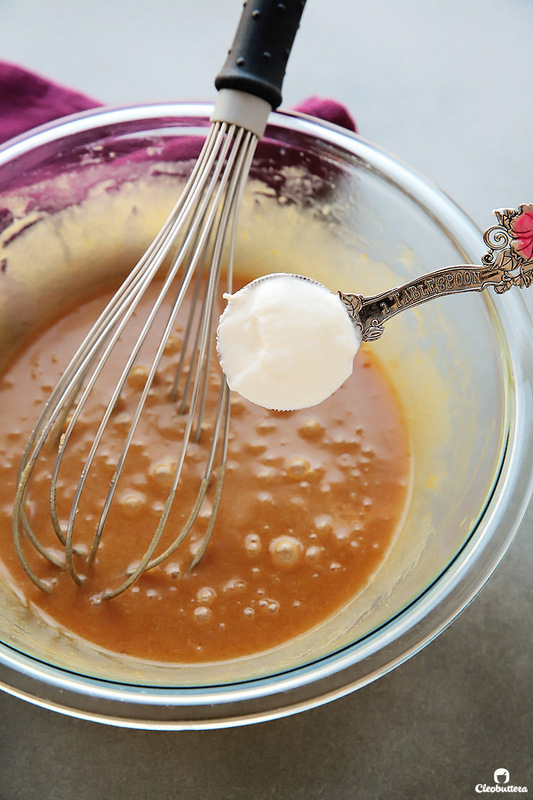 I’ve tried so many different types of caramel for the job, including this favorite, but non worked better than this genius microwavable recipe. It held it shape well during baking, so no cookie volcanic eruptions, yet remained nice and soft to the bite. You could use store-bought caramels if you really want to, but try to pick the softest kind available. I’ve only ever tried Kraft and they hardened, but if you can find something as squishy soft as the homemade ones, by all means use that! It’s pretty much known by now, that melted butter makes for chewier cookies, so it was the obvious state of choice here. And since we’re melting butter, might as well push it a little further over the stove to brown it. Guys, I cannot say enough amazing things about browned butter. I’m obsessed with it and have used it whenever I can in so many recipes on the blog like this, this, this, that and that. The simple process of browning, elevates the flavor of butter, giving it a mesmerizing toffee, nutty taste and aroma. 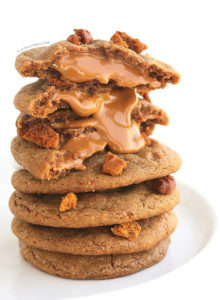 It’s a thing of beauty and is the perfect addition in these cookies, in order to heighten their caramel flavor. 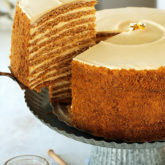 BROKEN RULE #2: Use mostly brown sugar, NOT all white. As mentioned earlier, classic snickerdoodles are made with all white sugar. I’m gonna remind you again that we’re NOT making the classic. So I’ve chosen to add more brown sugar than white sugar for 2 reasons. 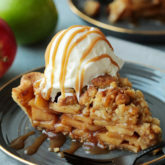 First, to add further caramel notes of flavor to the dough, that so nicely compliments the browned butter as well as the caramel candy center. Second, brown sugar is moister than white sugar, which means it results in softer, chewier cookies. BROKEN RULE #3: Add an extra egg yolk. I wouldn’t call this a broken rule per say, but rather a trick. 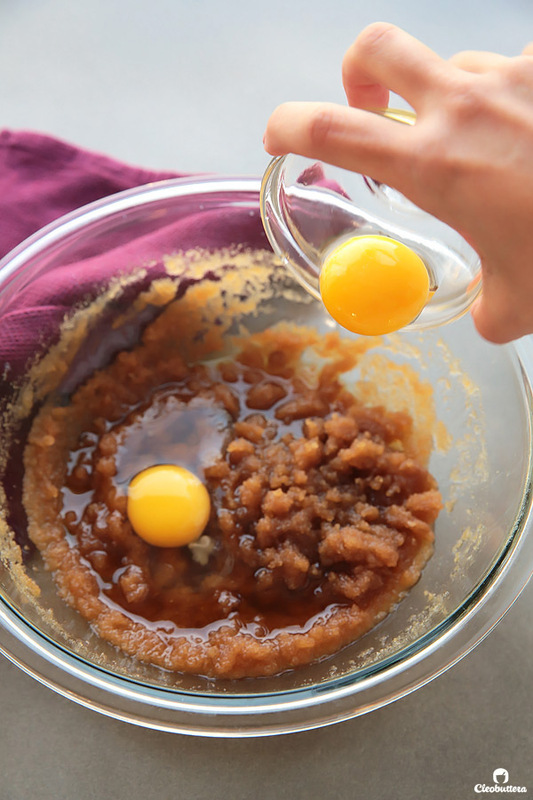 I use this extra egg yolk trick in most of my cookie recipes to increase their chewiness, and this dough is no stranger. BROKEN RULE #4: Add a tablespoon of sour cream. Not only does this add to the natural tartness of the snickerdoodles, but it’s a secret ingredient that keep the cookies so soft. I tried using both honey and corn syrup to achieve the same results, like I did in this blueberry cookie, but they caused the cookies to spread too much here. I’d assume that Greek yogurt will work as a substitute to sour cream, but I haven’t tried it myself, so don’t quote me on that. 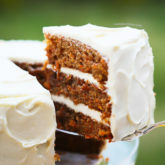 BROKEN RULE #5: Add 2 teaspoons of cornstarch. Just a little bit of cornstarch, helps make the cookies thicker and keeps them softer longer. 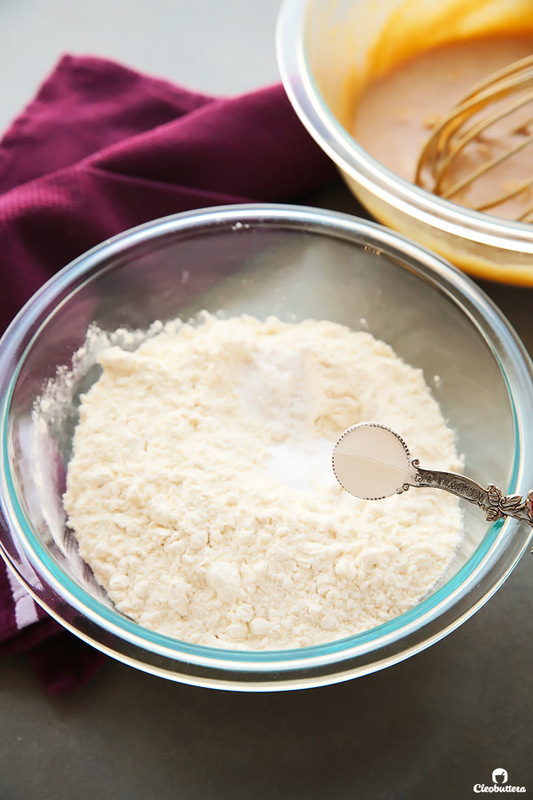 We all know that cornstarch is a thickener, and it works wonders in cookies. BROKEN RULE #6: Add baking powder. Snickerdoodles are typically leavened by a combination of baking soda and cream of tartar. But I found the addition of just a tiny bit of baking powder (along with the baking soda and cream of tartar) gives them a better lift and makes them puffier…and I’m all for puffy snickerdoodles that ripple and puddle like a bulldog, with minimal cracks. Baking powder will give you just that! Which brings me to the biggest Snickerdoodle dilemma of all. 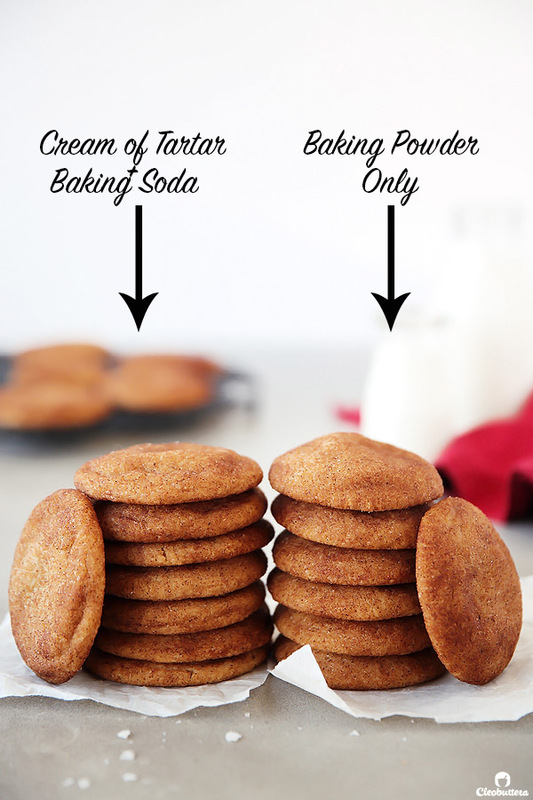 BROKEN RULE #7: If you don’t have cream of tartar, you could still make Snickerdoodles! 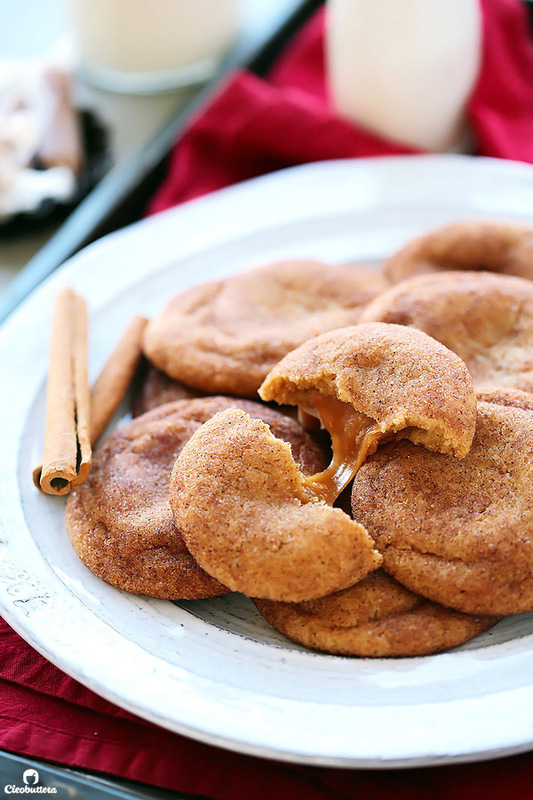 I know Snickerdoodle fanatics while gasp at this one. But let’s face it! Cream of tartar is not readily available all over the world, including where I live…Egypt. However, I do buy some whenever I travel, but not everyone can do that. So if a nice guy in Germany or a sweet lady in Morocco want snickerdoodles, then who are we as bakers to deny them some?! So I did the research, ran the testing, and found the solution. If you don’t have cream of tartar, just omit it! But you’re gotta have omit the baking soda as well, and replace both with baking powder. In the photo above, the left batch was baked the traditional way; with cream of tartar/baking soda combo. The batch on the right hand was made with neither cream of tartar nor baking soda, but with baking powder substitute. Can you visually tell the difference? Barely. Can you taste the difference? Only if you have super human tastebuds. Here are my observations anyways: The cookies made with baking powder are a bit puffier and rounder, so you won’t get that rippled bulldog appearance. 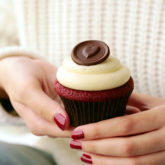 They also have an ever-so-slightly cakier, softer texture that is so difficult to detect. They have no cracks, and a tiny bit of that classic tanginess is lost, but still every bit as delicious. In fact, all of my taste testers weren’t able to tell the difference until I pointed it out. Only then did they actually prefer the cookies made with all baking powder more than those made with cream of tartar/baking soda combo for their softer texture. I personally can’t decide which I love more; I’ll have both thankyouverymuch. So bottom line, if you have cream of tartar, go for it! If you don’t, well there you have it! 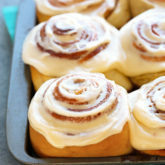 BROKEN RULE #8: Add cinnamon to the dough. We add a teeny bit of cinnamon to the dough itself because…hmmmm….its just way more amazing that way. I have nothing scientific to say here. And that’s it! Our mega flavorful dough is now ready! I bet you won’t be able to stop eating it raw. SO GOOD! Snuggle in some rounded caramel squares. I like to freeze them before hand…just makes it less messy, but you don’t have to. Roll ’em in cinnamon sugar. No rules broken here thank goodness! Then bake them juuuuuuust until the edges are barely set, but the centers are so so soft; borderline raw. Err on the side of underbaking if you want them super soft. If they crack too much, then know that you’ve overbaked them. 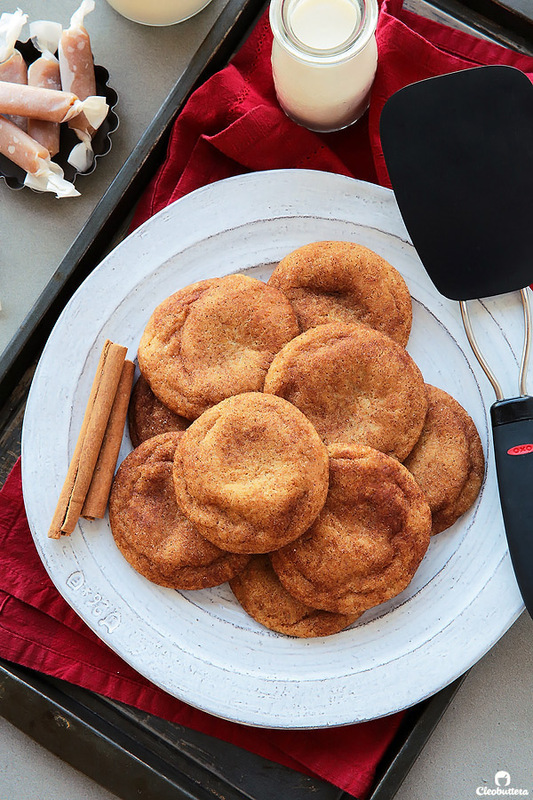 Open one up, then give yourself a high five for making the best snickerdoodles EVER! My family still can’t get over these. 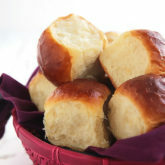 They’re pillowy soft on the inside, slightly crackly on the outside, and screaming with flavor! They’re anything but boring. And that caramel…can’t go wrong with that! We might’ve broken so many Snickerdoodle rules today…but who cares when we have something that looks like this…. If using homemade Microwave Soft Caramels, make and cool the caramels according to this recipe. You could also use your favorite recipe for homemade soft caramels instead or take a shortcut and use the softest store-bought caramels you could find. Prepare them for stuffing by cutting 8 rectangles of caramel in half. 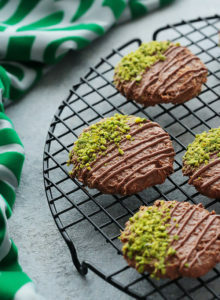 You'll need 16 pieces for the cookies. Using your fingers, squish and shape each piece of caramel into a rounded 1-inch square. 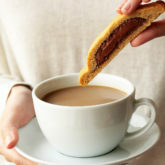 You could make them slightly bigger, if more caramel-y centers are desired, by using up 3/4 of a caramel rectangle for each cookie, but not more than that. Store in the freezer until ready to use. Freezing is not necessary, but makes stuffing the cookies a lot less messy. In a medium bowl, whisk together the flour, cream of tartar, baking soda, baking powder, cornstarch, salt and cinnamon to combine; set aside. In a light-colored skillet, heat the butter over medium-high heat until melted, about 2 minutes. 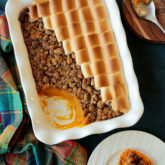 Continue cooking, stirring and scraping the pan constantly with a heatproof rubber spatula until the butter turns dark golden brown and has a nutty, caramel-y aroma, 1 to 3 minutes. Be careful not to burn it. 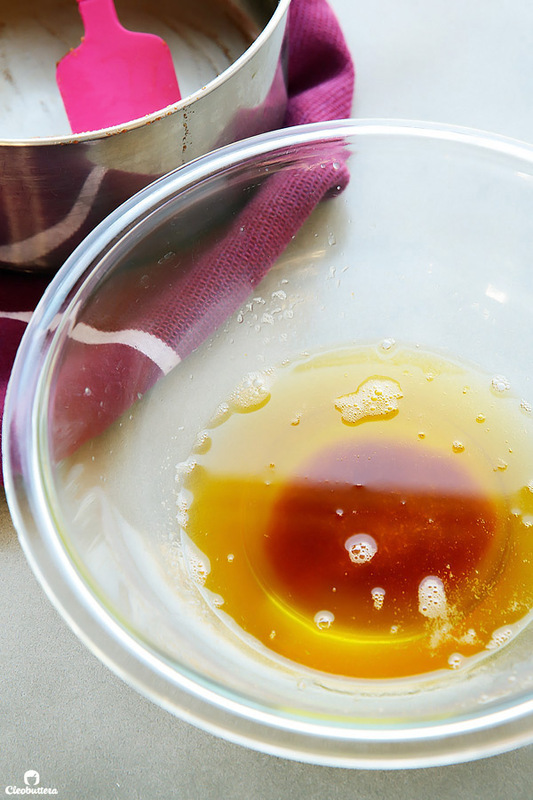 Remove the skillet from the heat and transfer the browned butter to a large heatproof bowl, scraping down all the brown bits with a rubber spatula. To the bowl with the butter, add in both sugars and whisk to combine. Add in the egg, egg yolk and vanilla and whisk until mixture is smooth and emulsified with no sugar lumps remaining, about 30 seconds. Stir in the sour cream until well combined. 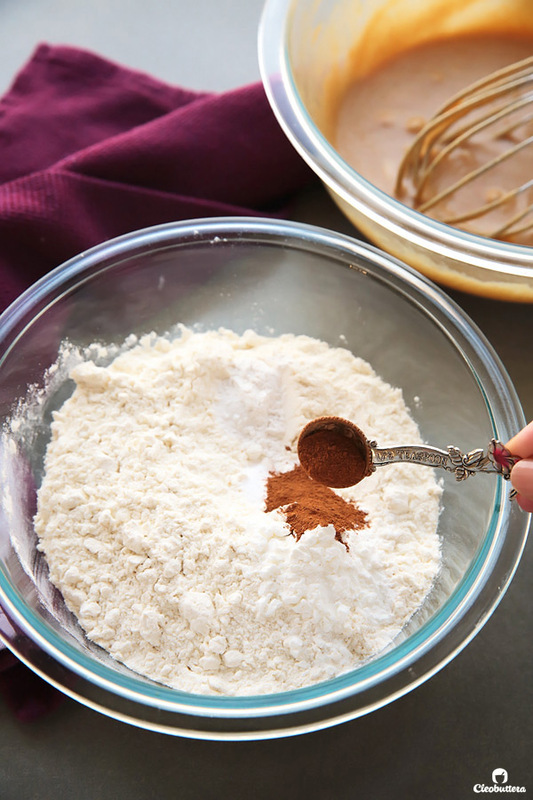 Using a rubber spatula, stir in the flour mixture until just combined and no flour streaks remain. Do not overmix. 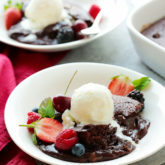 Using a 3 tablespoon-measure ice cream scoop with a release mechanism, scoop out the dough onto the lined baking sheet, forming 16 equal dough balls. If the dough feels too soft or warm to scoop, cover and refrigerate for about ½ an hour until scoopable. 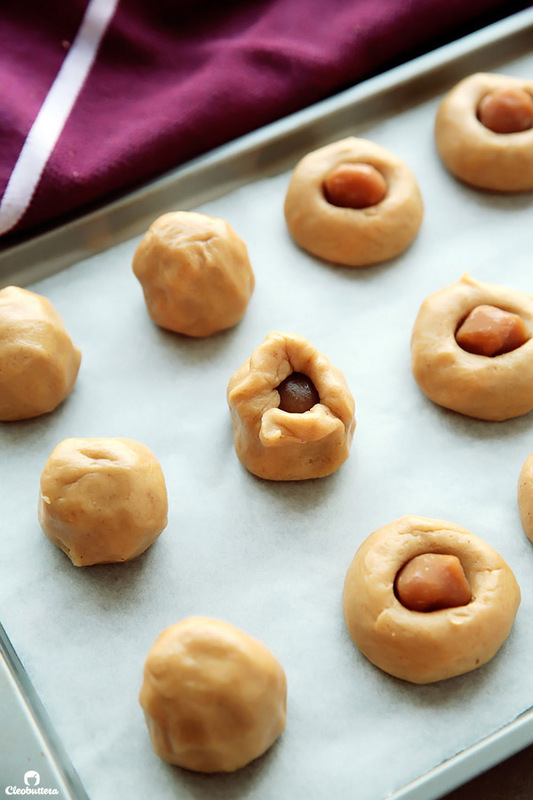 Take the caramel candies out of the freezer and place one inside each indentation of every dough ball. Gather the dough up over the caramels to completely cover them. 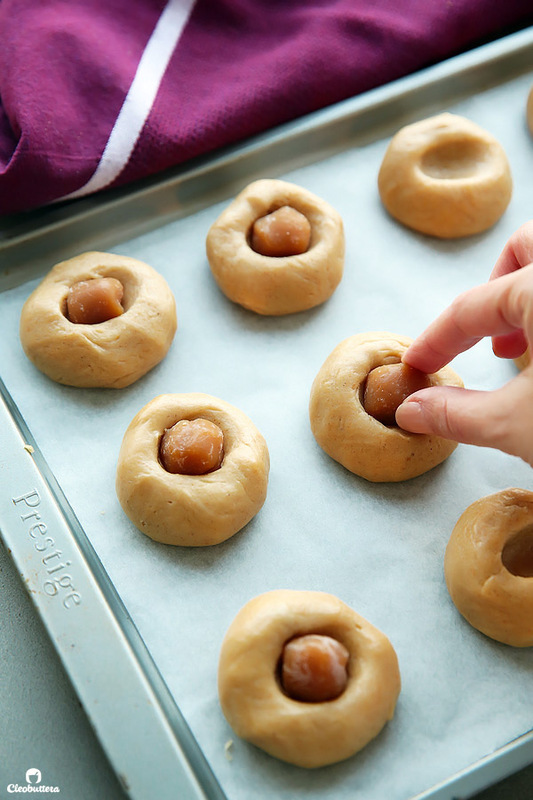 Roll the dough into smooth balls, making sure the caramels are completely wrapped inside and nothing is peaking out. 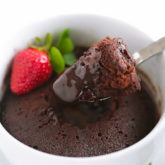 Combine topping ingredients (the granulated sugar and cinnamon) in a small bowl. 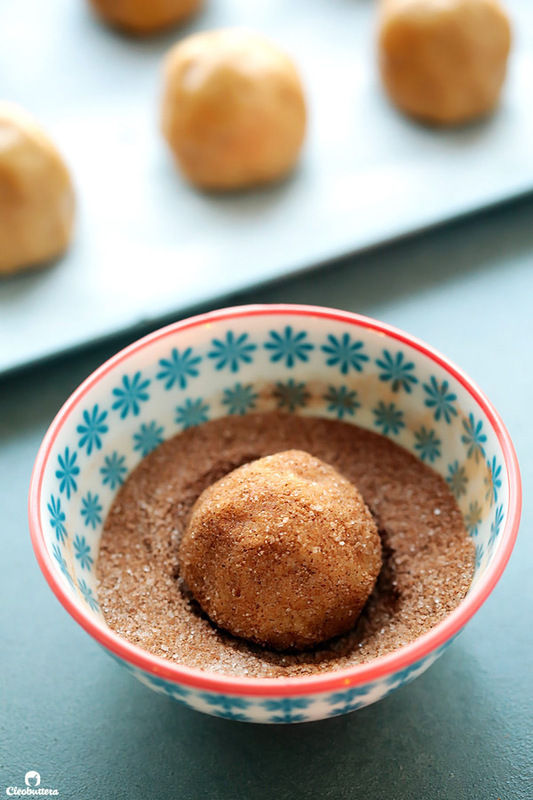 Roll the cookie dough balls into the cinnamon-sugar topping and place on the prepared baking sheet. Fifteen minutes before you're ready to bake, heat the oven to 350F/180C and adjust oven rack to middle position. Line 2 baking sheets with parchment paper or silicon mat. Place 8 cookie balls per sheet, spacing them at least 2 inches apart. 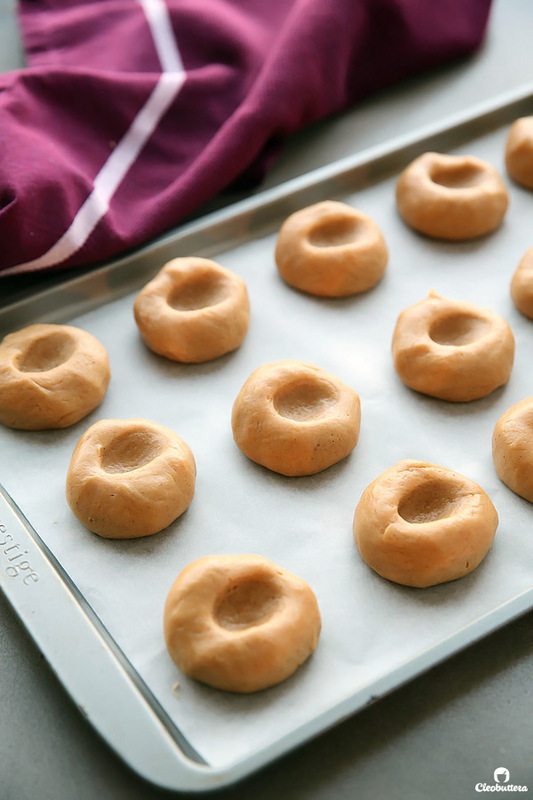 Bake until the cookies flatten with a slight dome, no longer have a hump in the middle, and the outer edges start to set yet centers are soft and puffy, 9 to 11 minutes. The centers will feel undone, but they shouldn't be shiny or sticky. DO NOT OVERBAKE or you'll get hard cookies. The cookies will continue to bake after they come out of the oven from the residual heat of the baking sheet. 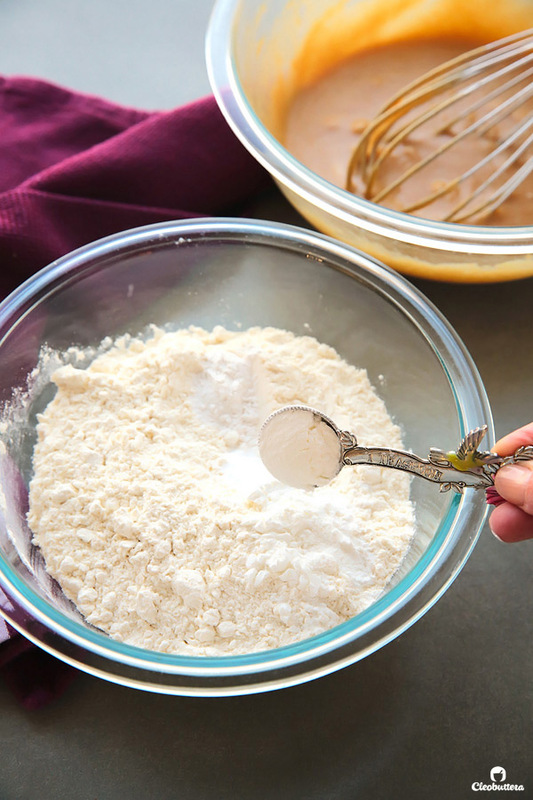 Weighing ingredients is highly recommended, but if you don't have a kitchen scale to weigh the flour, use the Spoon & Sweep method: Use a spoon to lightly fill measuring cup with flour until required amount is obtained, then sweep access with the back of a knife. Use the soft kind of brown sugar that feels and looks like damp sand like Dominos brand. Avoid the coarse, granular type of brown sugar like demerara. Use fresh, moist brown sugar instead of hardened brown sugar, which will make the cookies dry. 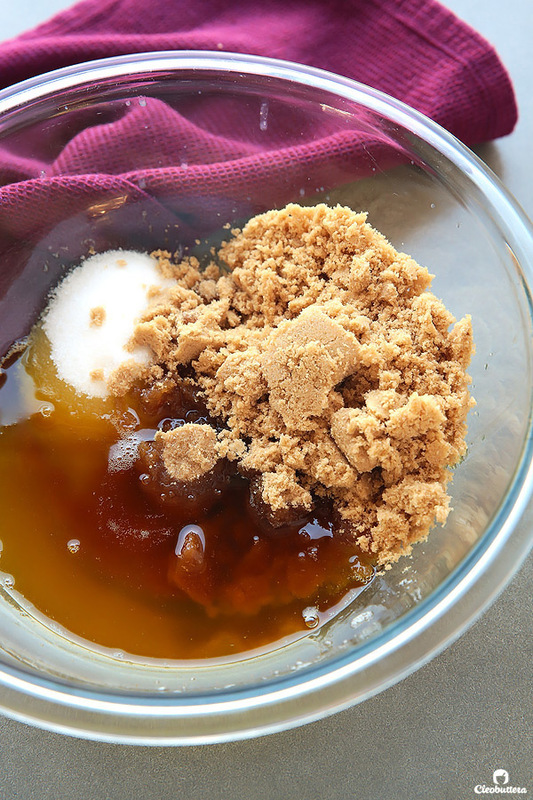 This recipe works well with both light and dark brown sugar. 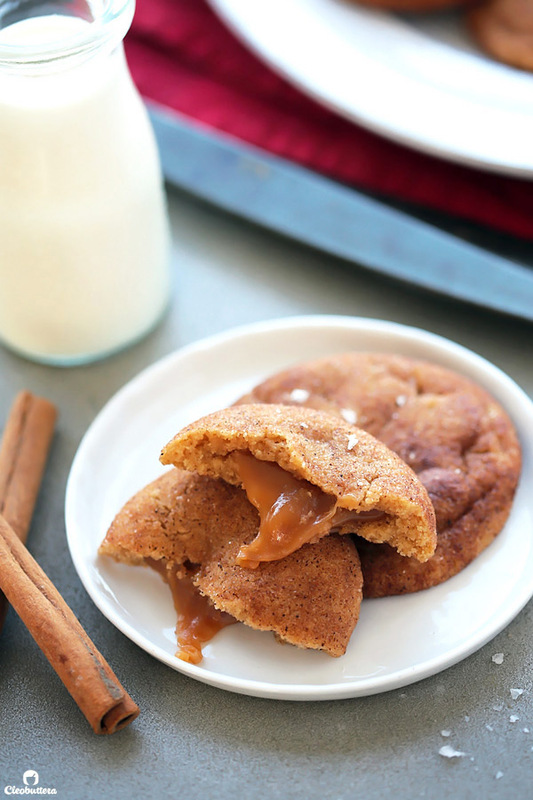 Dark brown sugar will make the cookies more caramel-y in taste, so it's up to you. Again, I can't decide which one I like best. I love both! 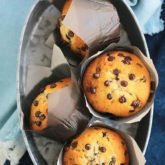 Cookie dough balls could be chilled in the fridge for up to 4 days or frozen for up to one month in a zipper lock bag. Bake straight from frozen. You might need to add an extra 2 minutes to the baking time. 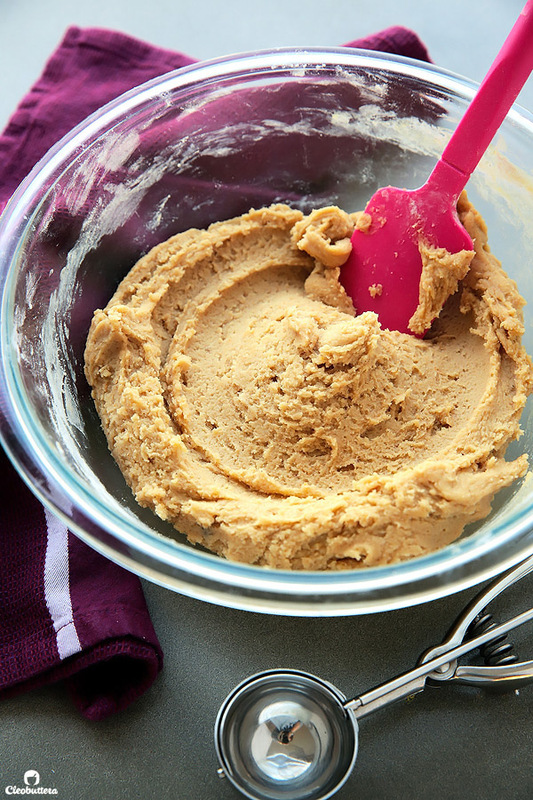 Cookie dough recipe is a Cleobuttera original. Caramel filling adapted from these Microwave Soft Caramels. The fact that you took the time to write such a sweet comment, means so much to me Maseera. Thank you dearest for that. Look who’s talking? The ultimate rockstar of the kitchen. Sabrina you’re the Queen of ALL food! Hahahaaa I hope I don’t let you down. I think it’s a matter of perfecting proportions and finding the right technique, more so than ingredients. You’re gonna make me want to visit Talaat to know the kind of basbousa that was capable of lingering in your memory. 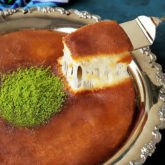 My favorite is from a place called El Helmeya, second by Sweet Stars. Did I miss where you added the sour cream?? Oh no! Thanks for pointing it out! Totally forgot to add it. Just fixed it 🙂 It goes in right after whisking the eggs and vanilla. Thanks again!